I have wanted to share my friend's home with you for awhile. I'm only showing some of her beautiful property. Her home is on the Bluffs overlooking the city and she has decorated the interior with a 1930's flair. 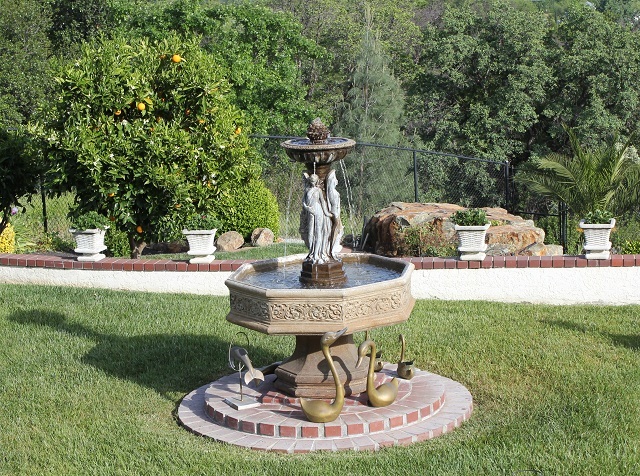 This fountain is overlooking the city and at night the fountain is lite with the water flowing over the top. It's amazing. In 1885, J. A. Bauer (John Andrew "Andy" Bauer) bought out Frank Parham's Paducah Pottery in Paducah, Kentucky, a pottery whose main products were brown-glazed, had-thrown wares including crocks and jugs. J.A. Bauer moved his family to Los Angeles in early 1909, and selected a new site for a pottery. J.A. Bauer Pottery Company was built at 415-421 West Avenue 33 in Lincoln Heights. an area between Los Angeles and Pasadena, California. Bauer found a demand from the nursery trade and added new products to the pottery's wares including flower pots, garden ware, and planters. Around 1930, Bauer Pottery introduced California Colored Pottery. By 1933, the company added ruffled or "ring" dishes. The collection is just amazing. 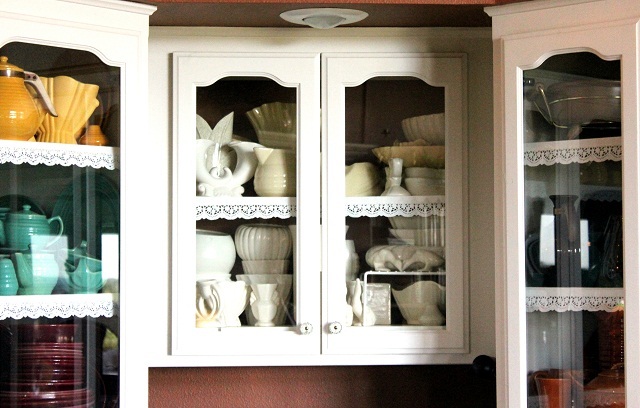 I would love to open the doors and photograph the beautiful dishes and show you more of the collection. A beautiful home inside and outside. And a beautiful women inside and outside lives here. 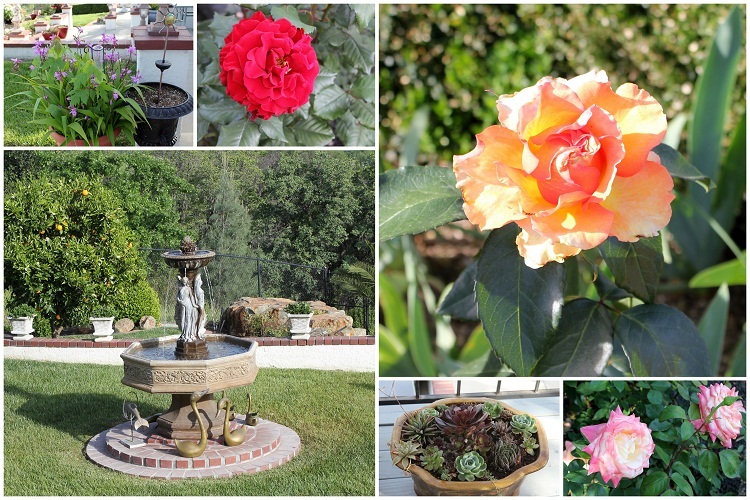 Beautiful rose gardens and different areas of interest. It's a treat when this wonderful lady invites a group of friends to share the view on the Bluffs to watch the city's 4th of July fireworks display. It's a half hour show around ten in the evening when the sun goes down the temperature can sometimes still be in the 90's. What a great time we have. Thank you, dear friend for entertaining us all those years. Please link back to the wonderful parties and enjoy the moment! how beautiful the grounds are..and what a collection...I have never seen anything like that before..
Beautiful inside and out...The pottery collection is amazing. 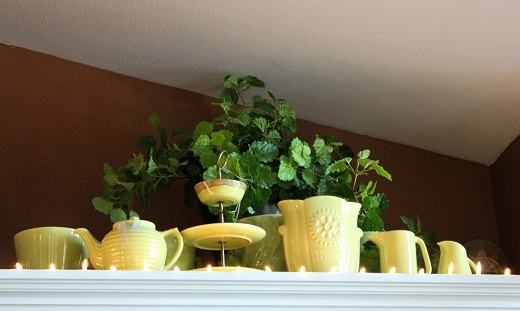 I love vintage pottery of all kinds..Thanks for sharing her wonderful home. Betty -- what GORGEOUS pottery. Your friend's home and gardens are so very beautiful! Holy cow!!! Love the pottery. And love the storage even more. Thank you for sharing such a beautiful and bountiful collection. It is nice to see it so nicely displayed instead of hidden away. I so wish that I could pull something like that off! 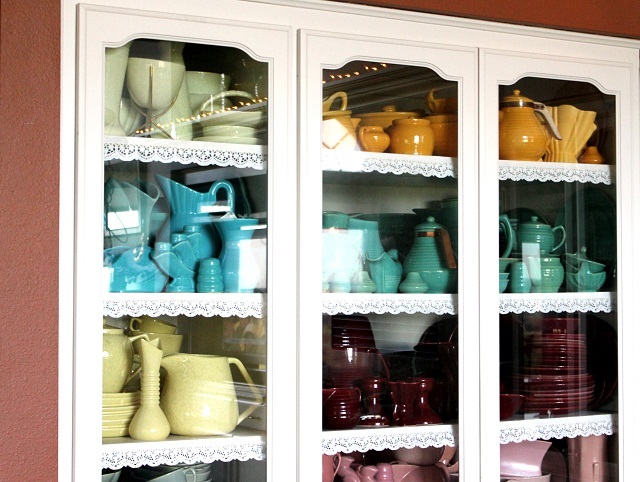 Love the cabinet with different color pottery. Wanna come over and help me decorate? Haa! BTW, I came over from Katherine's Corner to say hi! Will follow! Hello Betty, Thank you for sharing your friend's home with A Return to Loveliness. I know I have some of this pottery! I'll just have to find it! 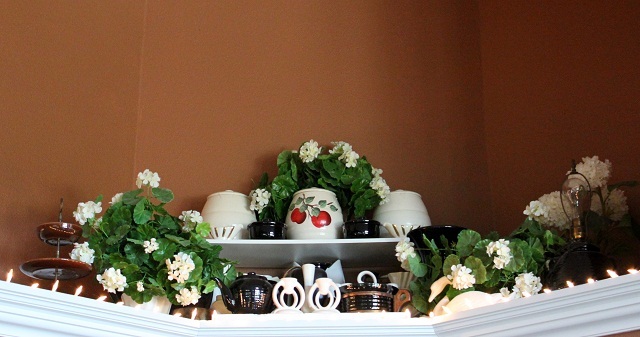 She has an amazing collection and a beautiful home - inside and out! Wow! I have always admired California Pottery. I buy it when I can. Thanks for sharing this today. The pottery is beautiful and the info is fun to read. Oh. 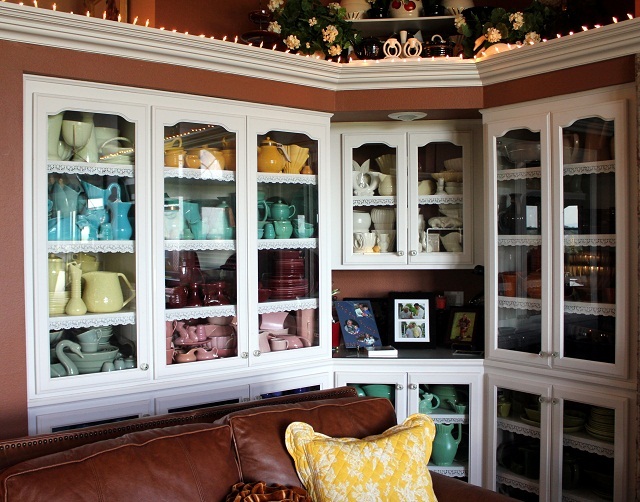 This post makes me what to rethink how I display things...this is a beautiful home and love, love the pottery!! Wow...what a collection. Happy VTT! You are lucky having this lady as a friend and sharing her home with others. I never had a friend like this. Oh I just had to pin this in my pinterest. What a beautiful display. What collectibles. I love your blog. Please come and get entered into my little giveaway at Something Special. I am your newest follower.